I've finally found time to read this little beauty... now I want more! I loved the characters and the world Abbi has created. I hope we don't have to wait too long! Until Friday Night was a deeper read than what I expected. 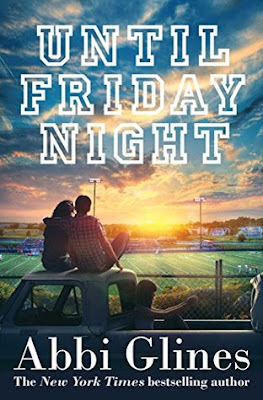 I love reads that involve sports like football, and expected there to be a lot of flirting and normal jock behaviour. But once you read the blurb, you can see it will be a difficult read; it was more about growing up in a small town and how to deal with loss. It was heartbreaking, but these difficult times brought two people close together. Maggie doesn’t speak to people, and I wasn’t sure why to begin with, but slowly details come to light and I knew it was due to a graphic and intense situation that anyone would struggle with. Her story was already tugging at my heart, but she could see something in West that no one else could see and she was determined to help him through his sadness. West was living in his own hell, seeing his father – his idol – slowly die, that gutted me. The tears sprang forth and I was so glad he was able to build a stable friendship with Maggie to help him get through it. He appeared to be confident and arrogant in front of his friends, but inside he was struggling on what to do to help his mother. His relationship with Maggie and the advice she gave him made him a stronger and better person, which I was glad to see. There were a few secondary characters introduced that I am dying to see more of. Maggie’s cousin and best friend, Brady, is one of them. I could see him struggling with how to deal with Maggie. He would take her to school and everywhere his mother suggested, but Maggie told him that she would be fine on her own. But he showed how protective he was of her numerous times. Brady and West’s close friends from the team, Nash, Gunner, Asa and Ryker were great support too. They stepped up when needed and even had Maggie’s interest at heart. Abbi Glines blew me away with the emotion she dragged out of me while reading Until Friday Night. West wasn’t nice in the beginning, but I could see the turmoil he was going through. I saw how difficult it was for Maggie to start over at a new school, being different and wanting to do everything on her own so she didn’t burden her cousin. Then the heartbreak of losing someone you love, and how to deal with strong feelings toward your friend. I laughed, swooned and cried, and hoped that both West and Maggie would be able to draw strength from their loss and from each other. I loved seeing the change in both of them; Maggie became a stronger, more confident girl and West was more open about his feelings. If you haven’t tried a book by Abbi before... start here, you won’t regret it! I have two swoons again today (I can't help myself!) One amusing, one sweet! When I walked out of the locker room, Maggie was standing there waiting on me. Her smile when our eyes locked eased the sadness I’d felt when I walked out and my dad wasn’t there. “You were amazing. . . . I think. I don’t know much about it. But you look really good in those pants,” she said in a whisper when I got close enough to hold her. Chuckling, I kissed her forehead, then her nose, and finally her mouth.